Boy, oh boy, do we have a great bag in store for you all this week. What better way to welcome in September than with homemade pizzas, stuffed zucchini & spaghetti squash boats and heaping bowls of ratatouille??? Keep reading to check out what you'll be getting in your bags this week. 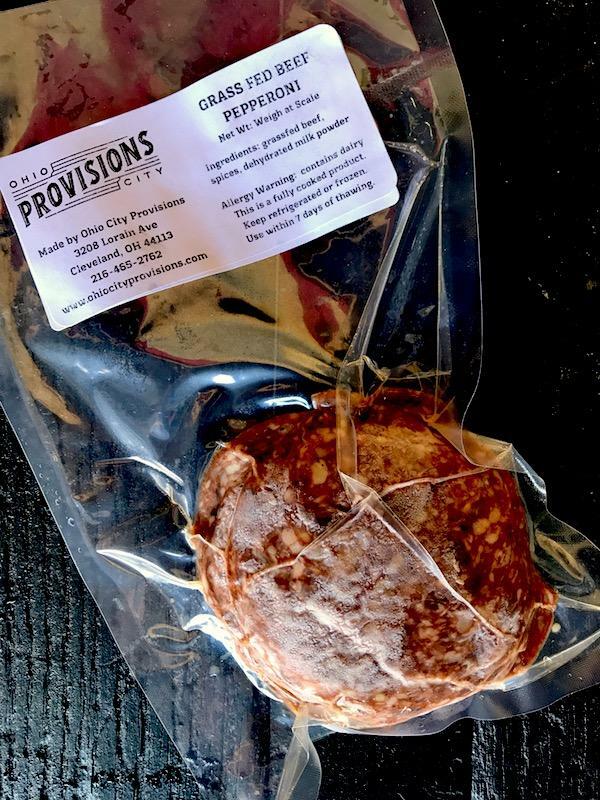 With the holiday coming up this weekend, now is a great time to use up some credits and stock up on all your favorites for the summer's last cookouts: we've got extra pork roasts for making pulled pork, bulk chorizo, speciality burger patties from Ohio City Provisions, ground beef, whole chickens, tortilla chips and so much more up in our store online for Special Order. 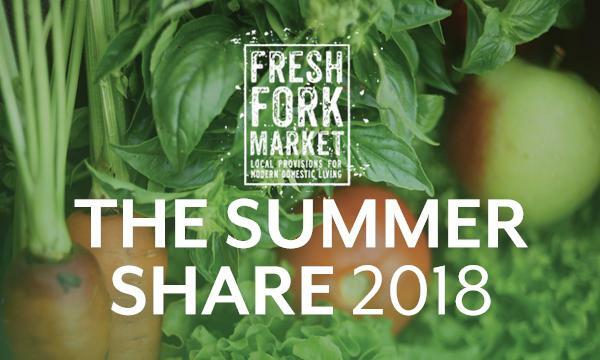 We'll also be bringing lots of extras out on the routes, too-- some freshly baked buns from Fluffy Duck Bakery, extra produce and a bunch more. 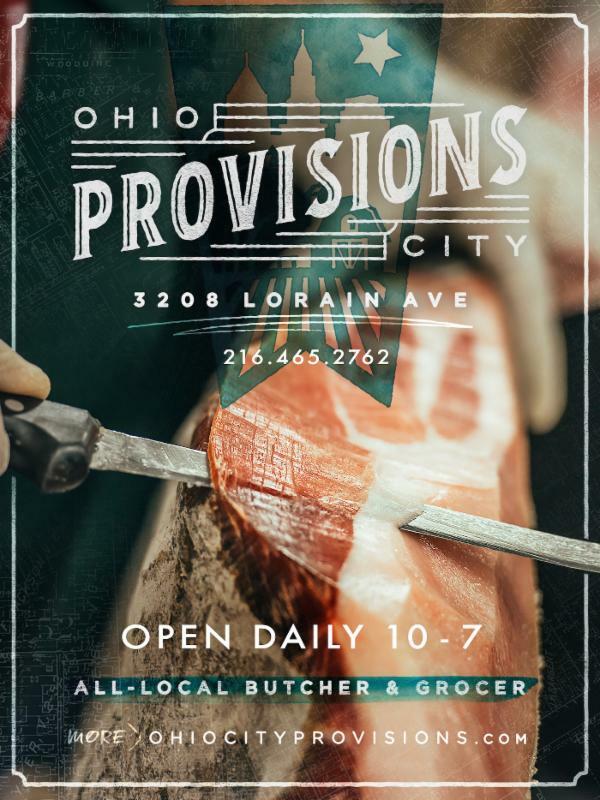 And don't forget to pop into Ohio City Provisions this weekend-- they're getting ready for the holiday too by making buckets and buckets of their famous fried chicken, specials on grilling packages (brats, burgers and buns), smoked pork shoulder and ribs and so much more. Call ahead to pre-order for pick up on Monday, or stop on by to see what's still in stock. Limited hours on Labor Day, from 10am-3pm. Get in on their mailing list, "Meat in Your Inbox" here . 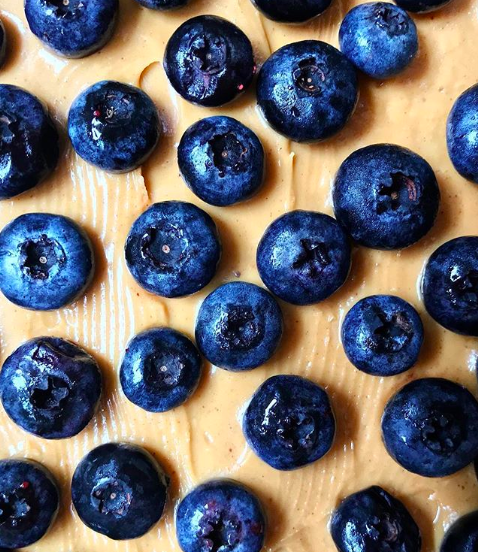 A beautiful spread from self-proclaimed blueberry fiend, @ericaistiny . This week, we saw odes to tomatoes, simmering pork and apples, and glam shots of your bags, just waiting to be cooked-- thanks for the beautiful pictures! This week-- pizza challenge! Tag us in all of your pizza creations, and don't forget to list your creative toppings to continue inspiring your followers and fellow Forkers. This week, all the bags (except the Vegan Shares) will have a slab of Flat Rock cheese. 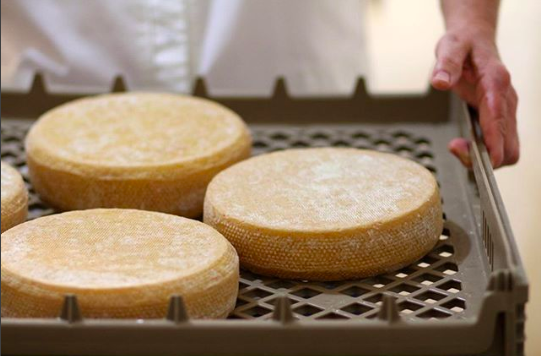 It's a raw-milk Parmesan or Abondance- style cheese, aged 4-6 mos, which is inspired by the "Alpine-Style" cheeses made in the mountains near the border of France and Switzerland. 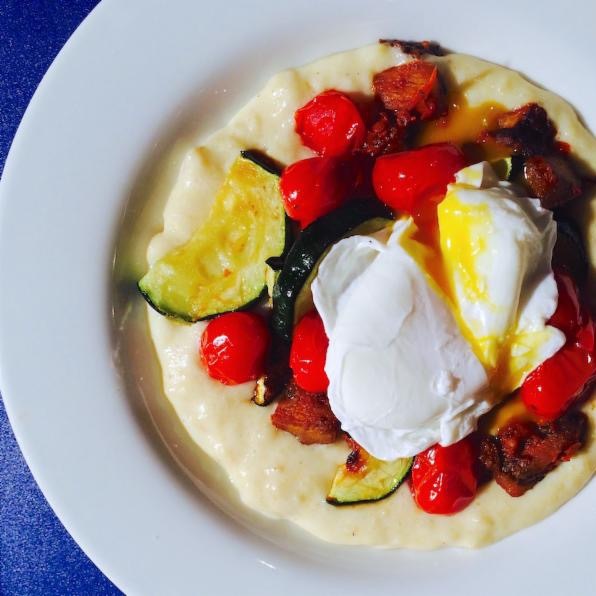 It's firm with a rich golden hue, an earthy-nutty-mushroomy flavor and is named after the Flat Rock Creek, which flows just south of the Schlatter family's Canal Junction Farm in Defiance, Ohio. Each year we are proud to feature many cheeses from our friends Ralph and Sheila at Canal Junction, and Flat Rock is one of our favorites because it is so versatile: good to snack on, easy to grate for cooking, and it melts well on pizza or gratins. Another important note about this cheese is that the style reflects the farming practices and genetics that Ralph and Sheila feature. 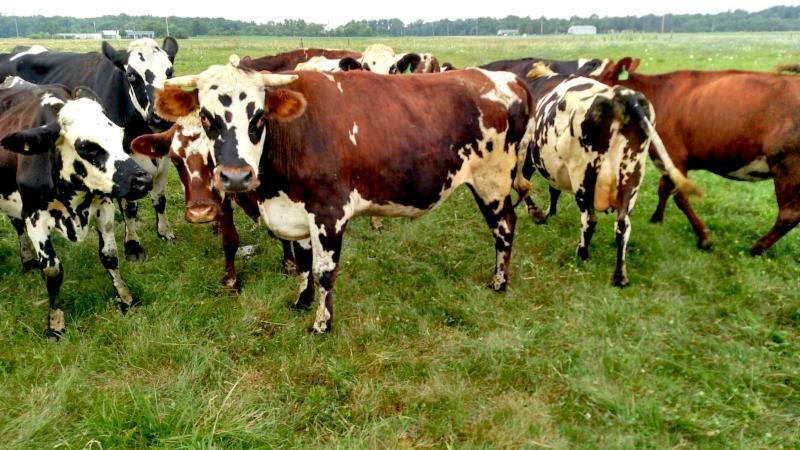 They are a 100% grass-fed dairy, focusing on rich leguminous pasture grasses and rotational grazing. They have found over the years that genetics play an important part in this, so they worked with our own Chef Parker Bosley and a researcher from University of Wisconsin to start using Normande genetics in their herd. The Normande breed of cattle is a French breed known for being hardy and efficient on grass. It is a "dual purpose" breed, meaning they are good milkers for dairy production and also do well for meat production, which makes the breed perfect for a sustainable small farm operation like the Schlatter's fifth-generation family-managed farm. Ralph and Sheila keep their cows and heifers for milk production to use in their bottling operation and cheese-house, while their son Kyle grazes the steers (castrated males) for beef production. Normande Steers from Canal Junction grazing at Wholesome Valley Farm before they're moved on to be processed for beef. We'll have lots more announcements coming out soon, including this year's Farm Tour Event (tentatively planned for Saturday, Sept 22nd), Thanksgiving Pre-Order, Salmon Buying Club and more. Time for pizza! Our Whole Wheat Pizza Dough is made with our organic whole wheat flour, honey, yeast, sunflower oil, water and a pinch of salt. Your dough will likely not stay fully frozen on the drive home–it thaws that quickly! But, if you're not ready to use it, you can pop it back in the freezer (for up to 3 mos),or keep it in the fridge for a few days– 3 tops. The longer you let it go when it’s thawed, the less effective the yeast will be. Allow your dough to fully thaw in fridge, and then come to room temp on the counter for 30-40 minutes. Preheat oven or grill, with a pizza stone or rimless pan already inside, to a temp of 500 degrees. Spread a few tablespoons of flour or cornmeal on a clean countertop. Once the dough has risen 2x, remove it from bag and set it on floured surface. Punch it down into a circle by flattening with your hands. Lay a rolling pin across the middle of the dough. Roll the dough from the center to the top, and from the center to the bottom without rolling the pin all the way off the dough. Give the dough a quarter turn and repeat. Continue rolling and turning till it’s a little bigger than a dinner plate (about 10″ – 12″) and about ¼” – ½” thick. Dust a pizza peel or thin cutting board with cornmeal (cornmeal is your friend, so use a bunch for easy transfer and a crunchy bottom crust), and place dough on top. Using your hands, stretch, pull, and form your dough turning in a clockwise motion until you have an even and properly-sized pizza. Be careful not to tear the dough here, just stretch it thin. With a fork or dough docker, stab little holes over the entire surface of the pizza dough to prevent bubbles from forming in your pizza dough/crust as it cooks. Add your toppings-- go light! Read note below about toppings. 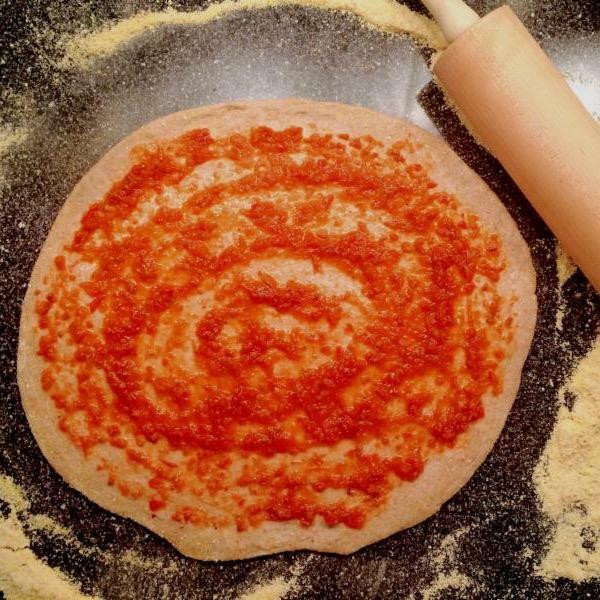 Wiggle your peel/board to see if your pizza will slide off the surface and onto the baking stone/pan easily. If it sticks, add a bit more cornmeal to the sticky parts. Quickly open the oven or grill and carefully slide the dough onto the cooking stone, closing it immediately to keep the temp high. A note from Chef Adam: "if your pizza sticks and falls onto the bottom of your 500 degree oven, turn oven off immediately and try to scoop the pizza out safely. If it is a sticky mess, let the pizza sit for just a minute or two in order to sear and release from the bottom of your oven. Once your oven is clear of debris, order a pizza for delivery and pour yourself a drink." Cook pizza for 7-10 minutes or until your toppings are melted and cooked and the bottom of the pizza is seared and crispy. If you want to check on the progress, use your oven light rather than opening it up. Carefully remove pizza from oven and slide onto a cutting board. Slice it up, add a drizzle of olive oil or honey, fresh herbs or a little grated cheese and eat it hot! Most of the mistakes made by home pizza cooks involve the amount and placement of toppings. Keep a high crust-to-topping ratio, and a remember that a little (topping) goes a long way. If you’re using a tomato-based sauce, go light. 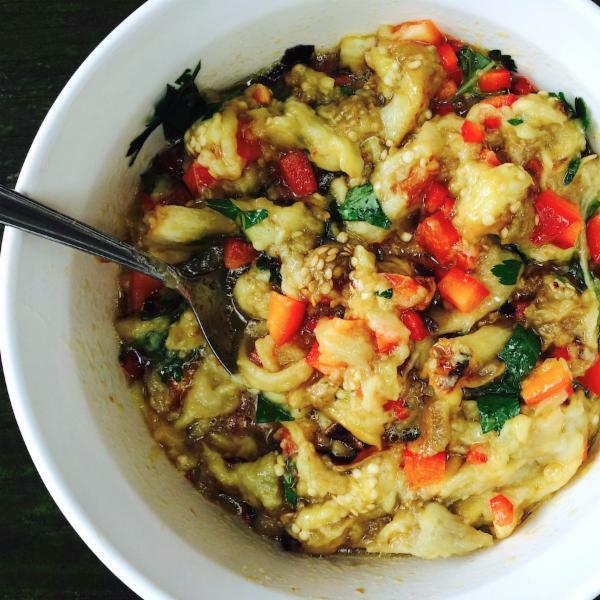 You can always add more, but too much sauce will result in a soft, fragile dough. It will also increase the chances of the pizza sticking to the stone. The sauce is the first layer, if you’re using it. Use a ladle to spoon some into the center of the pie. Using the bottom of the ladle, start to spread it out in concentric circles, going wider and wider till you almost reach the edge. Cheese is another ingredient that is often over-used. If using a shredded cheese, make just a light layer on top of the sauce, or if using mozzarella, cut into chunks and disperse over the pie. Some toppings need to be cooked a bit beforehand. 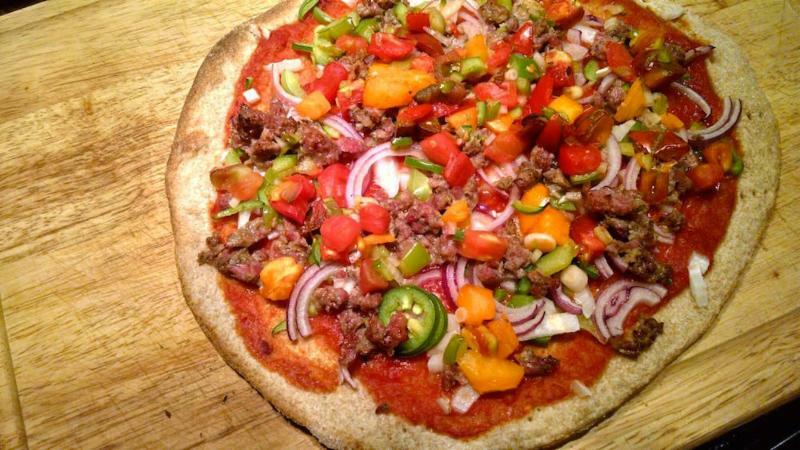 For example, you would not want to put big chunks of raw sausage on a pizza that is only going to cook for 8 minutes. You want your toppings to finish cooking at the same time as the pizza. For most meats (except thinly sliced, pre-cooked or cured meats like prosciutto or pepperoni, which can go on with the regular toppings) you want to par-cook them almost all the way through and then allow them to finish on the pizza. Some vegetables need a pre-cook as well. Mushrooms, eggplant, Brussels sprouts and bell peppers all do better with a sauté with a tiny bit of oil and salt until they are mostly cooked through. Toppings should be spread evenly across the surface of your pizza, which will ensure all your toppings will be nice and crispy and no part of the pizza dough holds too much weight. Some toppings don’t need to be cooked at all, and in fact are much better when just placed on the cooked pizza at the end. Fresh greens (like arugula, spinach and fresh herbs), ricotta, pesto, and white sauce can all go on right at the end or with just an extra minute or two in the oven. For loads of pizza recipes and topping ideas, check out our Pinterest Board, "Pizza!" 100% grass-fed beef with house-smoked Cayenne Peppers for a hint of spice. Perfect to top your pizzas or to layer into a hot Italian hoagie with Flat Rock Cheese this week. 6 oz per package from Ohio City Provisions, sliced and ready to eat. Allergen warning: contains dairy (dehydrated milk proteins.) 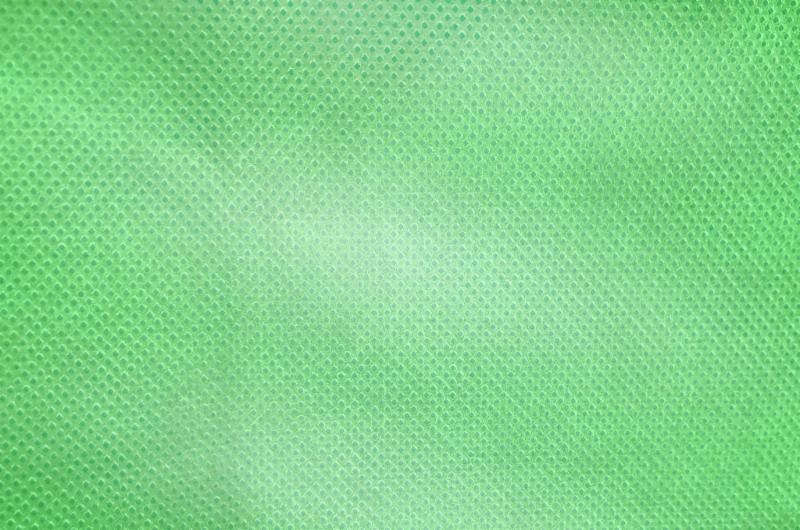 $7 per pack. 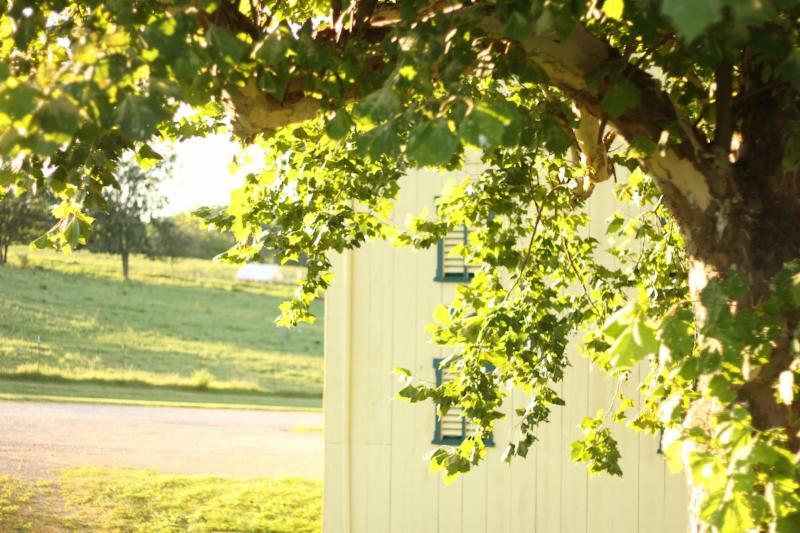 The Wilderness Center is hosting their Annual Forest, Farm & Fork Fundraising Dinner at the farm on Saturday, September 15th. 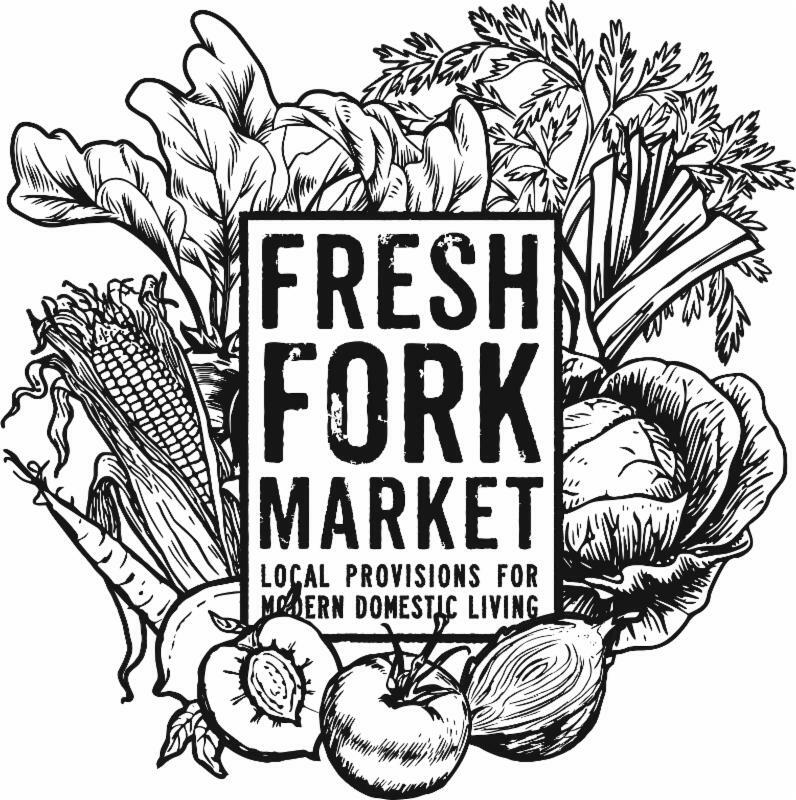 A multi-course menu prepared by the Wholesome Valley Farm-Ohio City Provisions-Fresh Fork Market team to raise money for this fantastic organization. $75 for Wilderness Center members, $100 for non-members. Click here for more details and to register. **Pizza dough contains gluten & honey. Please ask your Greeter for a sub if needed. 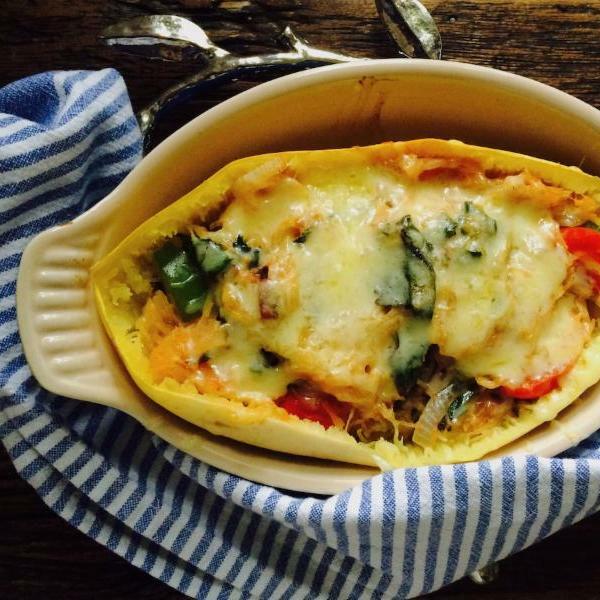 Ingredients from share: Spaghetti Squash, Cheese, Tomato Sauce, all the veggies! For more of our recipes, click here . FFM on Pinterest, "Beet, Beet, Boom!"